July 7, 2010, Auburn Hills, Mich.
For the first time in its history, Chrysler Group LLC will launch a special-edition Mopar version of one of its vehicles. 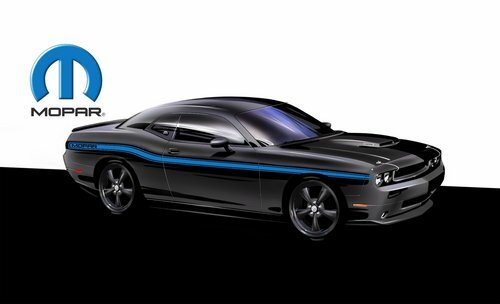 The Mopar '10, a Mopar 2010 Dodge Challenger, arrives in Dodge dealerships next month. "Our Mopar '10 Challenger is a collaboration of two iconic brands with tremendous heritage," said Pietro Gorlier, President and CEO of Mopar, Chrysler Group LLC. "Dodge put the heart into this Challenger and Mopar added the soul. The result is a unique, special-edition car that only we can offer." The U.S. Manufacturer's Suggested Retail Price (MSRP) for Mopar '10 is $38,000 for an automatic transmission and $39,000 for a manual transmission. Both prices include $750 for destination. Customers may pre-order now. "Mopar '10 has a wicked, sinister appearance that will turn heads." said Ralph Gilles, President and CEO of Dodge, Chrysler Group LLC. "The Mopar brand resonates with hard-core enthusiasts, and this car will too." Dodge and Mopar collaborated to create Mopar '10, a "Mopar modified" 2010 Dodge Challenger R/T. Under-the-hood features include the legendary 5.7-liter HEMI V-8 engine, a hood-venting system, a cold-air intake, a front strut-tower brace with shock caps, and a unique engine cover. Under the decklid is a rear strut-tower brace that stiffens the chassis and improves handling characteristics of the car. Mopar '10 will be available in Brilliant Black with a choice of three accent colors: Mopar Blue, Red or Silver. Accent colors will appear on side stripes as well as in the stitching on the steering wheel and seats. Exterior features include 20-inch forged heritage gloss-black wheels, black-chromed grille surround, and a functional, vented T/A-style hood with vintage hood pins. Mopar logos and graphics are prominent on the front fascia, hood, hood-pin caps, body-side stripes, windows and on the chromed fuel door. A special Mopar '10 car cover also comes with the vehicle. Interior features include Katzkin leather seating, custom leather-wrapped steering wheel with baseball-style stitching, Mopar shift handles (T-handle for automatics, Pistol Grip for manuals), a serialized dash plaque with Mopar '10 logo and Mopar branding throughout. Every customer who purchases a Mopar '10 will receive a special owner kit that includes a certificate with the vehicle identification number (VIN), date of build completion, and build number. The kit also includes a limited-edition sketch of the vehicle signed by Chrysler Group design chief Mark Trostle, a book that highlights the special vehicle build, and Mopar '10 merchandise. Chrysler Group LLC, formed in 2009 from a global strategic alliance with Fiat Group, produces Chrysler, Dodge, Jeep, Ram Truck, Mopar and Global Electric Motorcars (GEM) brand vehicles and products. With the resources, technology and worldwide distribution network required to compete on a global scale, the alliance builds on Chrysler.s culture of innovation -- first established by Walter P. Chrysler in 1925 -- and Fiat's complementary technology, from a company whose heritage dates back to 1899. Headquartered in Auburn Hills, Mich., Chrysler Group LLC's product lineup features some of the world's most recognizable vehicles, including Chrysler 300, Dodge Challenger, Jeep Wrangler and Ram 1500. Fiat will contribute world-class technology, platforms and powertrains for small- and medium-sized cars, allowing Chrysler Group to offer an expanded product line including environmentally friendly vehicles. Mopar (a simple contraction of the words Motor and PARts) was trademarked for a line of antifreeze products in 1937. It also was widely used as a moniker for the CMPC. The Mopar brand made its mark in the 1960s -- the muscle-car era. The former Chrysler Corporation built race-ready Dodge and Plymouth "package cars" equipped with special high-performance parts. Mopar carried a line of "special parts" for super stock drag racers and developed its racing parts division, called Mopar Performance Parts, in order to enhance speed and handling for both road and racing use.